The future of industrial polishing. Courtesy SYMPLEXITY. Industrial polishing is a cornerstone of manufacturing—a necessary but intensely manual process that creates a matte, gloss, shiny, flat, or otherwise-effected surface on any manufactured part. Surface-finishing methods vary from rubbing sandpaper to firing a laser, and human operators still handle the materials and judge the results. Although the process has a proud artisanal history, it’s hard to replicate and measure objectively. So why don’t robots do industrial polishing? Surely a machine that never tires and makes the same precision movement every time could be suitable for this type of work. Among those considering just that is SYMPLEXITY, a partnership of academia and industry from across Europe. 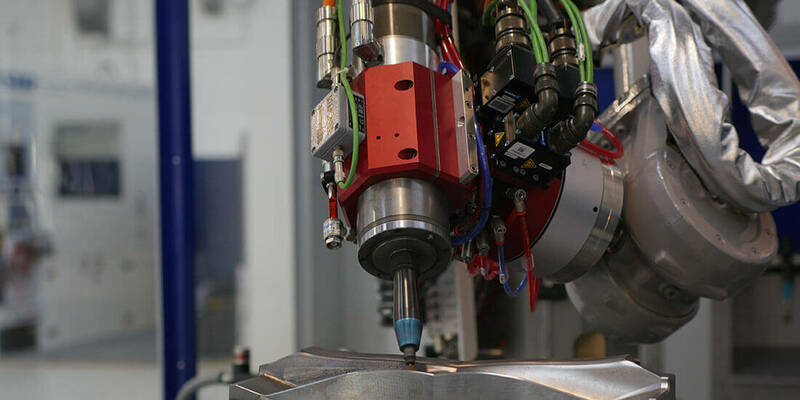 Comprising 15 partners from six countries, SYMPLEXITY emerged from three existing projects in programming, surface finishing, and human-robot collaboration. A robot performs abrasive polishing. Courtesy SYMPLEXITY. Factory robotic tasks are simple and repetitive: Dozens of robots make precise actions through just a handful of movements to assemble a car, for example. But for robots to polish surfaces on any part or object, they’d need to move through countless points of motion, changing with each different method, angle of approach, and force specific to each part. Removing 5 microns from something is easy for a human—asking a machine to do the same requires a whole new level of programming. A skilled human finisher can also tell if a surface is shiny enough at a glance, but without mathematical values, the term shiny means nothing to the software driving the robot. The best of all possible worlds might be collaboration intelligence, according to SYMPLEXITY project coordinator Sebastian Hähnel, a scientist from the Fraunhofer Institute for Production Technology in Aachen, Germany. “We try to get the intelligence from the human worker, such as sensitivity with his hands, adaptability, and flexibility,” Hähnel says. But it’s about much more than just polishing. Fausto Romagnani—who owns Milan, Italy–based Romagnani Stampi, which provides injection and compression molds for the automotive industry—considers SYMPLEXITY akin to the space race of the 1960s: a program that’s going to solve industrial problems that don’t exist yet. SYMPLEXITY brings partners on to generate research or commercial outcomes that emerge from the program, and the spin-off technologies from these efforts are both welcome and acted upon. 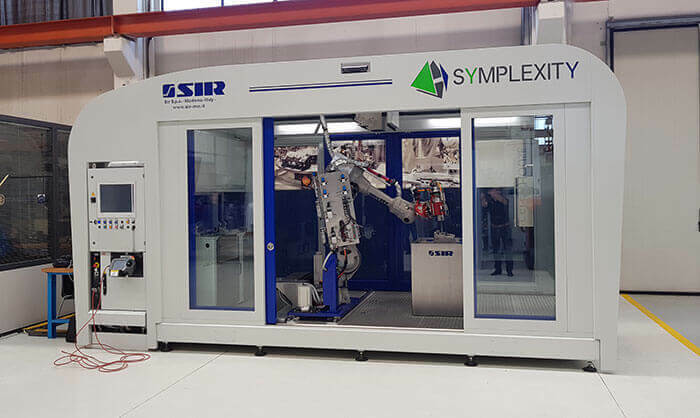 One of the most promising tools to emerge from SYMPLEXITY is the SIR Cell, a robot cell named after the consortium partner that produced it: Soluzioni Industriali Robotizzate of Modena, Italy. Based on existing technology with a spindle, tool holder, and other components commonly used in milling and CNC devices, the SIR Cell robot features highly developed capabilities driven by Autodesk PowerMill Robot. The SIR Cell. Courtesy SYMPLEXITY. Much of the algorithmic programming that will drive SYMPLEXITY’s polishing robots will be handled by machine learning. 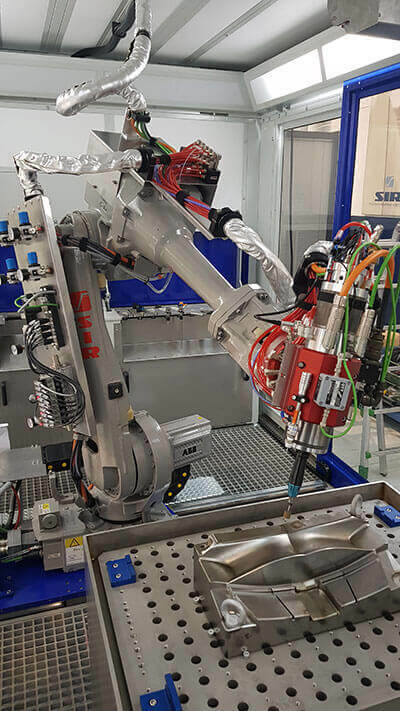 A pivotal component of the expected machine-learning innovations is surface metrology, a process through which the robot measures the surface and provides values relevant to intended performance. Systems of sensors collect information about any finish and provide mathematical values for shininess, defects, roughness, and more. 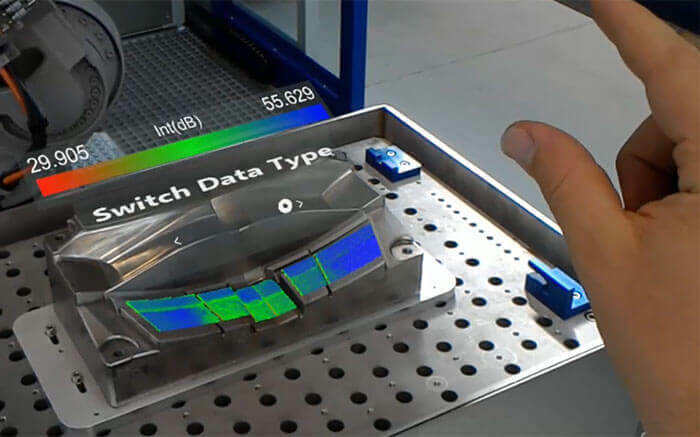 What the research hopes to show is that if the metrology system inspects a surface with insufficient quality, for example, a machine-learning system will change a step or parameter based on the analytic model. It might program for greater force so the removal rate increases, correcting future processes on similar surfaces with the same initial parameters. The next step after such course correction is for the system to make informed choices about polishing force, angle, speed, and so forth based on the needs of the part before it starts. SYMPLEXITY software engineers can see a future when CAD files, themselves, contain cues the robot needs to best finish the part. See SYMPLEXITY and the SIR Cell in action. These are loaded questions. Humans are better at knowing how to finish a surface based on experience and intuition, but robots will be faster and more efficient (and won’t need bathroom breaks). As robots learn, could they become as good as humans in every respect? With these technologies, instead of a human making a subjective ruling on whether a finished part is good enough, the completed finishing work can generate mathematical data assessing performance quality. One of SYMPLEXITY’s most exciting offshoots is developing the means to see surface-quality data using augmented reality (AR). One benefit of this could be offloading the expensive liability risk from human eyes and opinions. There’ll always be calls for a human expert to approve results, but when measurements of properties are so quantifiable, the data can be connected directly to quality assessment (QA) issues. Using the Microsoft HoloLens, SIR Cell operators can view metrology data on the surface of an actual part. Courtesy SYMPLEXITY. A view from the HoloLens showing metrology data. Courtesy SYMPLEXITY. Currently, the SIR Cell employs the QISAB CWS 640 metrology system to measure surface quality; it can report on as many as 13 data parameters. The Microsoft HoloLens can then display these measured data to the user, using AR to overlay these data on the actual part. 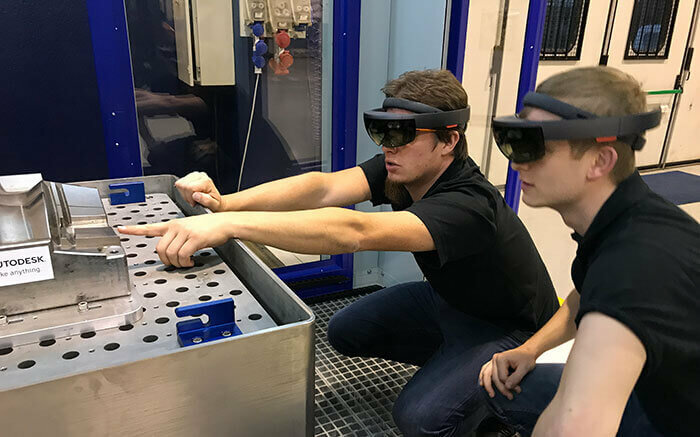 A client and operator can enter the SIR Cell and review the data through the HoloLens headset. This makes the SIR Cell both a manufacturing and QA tool in the same machine. Metrology data isn’t new, but AR could mean the end of flat 2D representations on screens. Rather than imagine how a certain parameter change will affect the part, the information is there on its surface. Users can see from the data where another tool or process is needed and make better, faster decisions—which is compelling for its potential beyond industrial polishing. With certain phases of testing and preparation complete, the SYMPLEXITY partners are ready to roll out real-world examples. If they’re successful, where will SYMPLEXITY go from there? Will SIR Robot Cells be commercially available? Will AR be a plug-in for CAM software? Every partner in the consortium owns its intellectual property—SYMPLEXITY just brings their expertise, complementary technologies, and ideas together. For some, that means pursuing further development, maybe with other partners in a new consortium. For others, it means having market-ready wares for sale. Either way, it bodes well for the future of manufacturing, robot capabilities, and human-robot collaboration.